Did Jesus teach Replacement Theology? What exactly is this doctrine? Did Jesus Teach Replacement Theology? One of the key “buzz words” in the Dispensational world is “Replacement Theology.” If that label can be placed on the opponents of Dispensationalism, that often results in a closed mind. After all, Replacement Theology ostensibly flies in the face of the Bible’s affirmation that Israel would remain God’s people forever. So, if one claims that Israel has been “replaced” by the Gentile church, this is a horrible miscarriage of God’s promises. After all, did Paul not say that God’s promises to Israel were irrevocable? he did indeed, so, how do we view this entire issue? Ice cites Gentry, who says that the church has superceded Old Israel for all time, and responds by saying: “I could almost agree with his definition if he removed the phrase ‘all time.’ We dispensationalists believe that the church has superseded Israel during the current church age, but God has a future time in which He will restore national Israel ‘as the institution for the administration of divine blessings to the world.’” In other words, Dispensationalists – Thomas Ice – admits that Replacement Theology is, at least temporarily, the will of God! Now, it is either the will of God, or not the will of God that the church “replaced” Old Covenant Israel. If it is the will of God that the church replaced Israel, then it is, at least hypothetically, possible that it is God’s will that the church replace Israel permanently! Of course, the bottom line is that the Dispensationalists do not believe that it was the eternal will of God for the church to replace Israel at all. 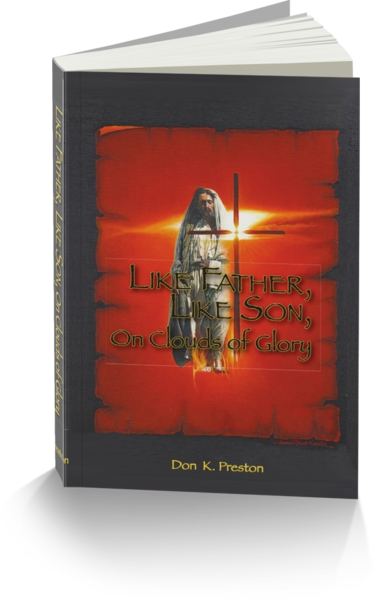 See my book, Like Father Like Son, On Clouds of Glory, where I demonstrate extensively that Israel, from the very beginning was a mere type and shadow of the better things to come. She was never the “reality” of God’s plan! This is stunningly important stuff! This book refutes the Replacement Theology charge and shows that Israel was always a shadow of something better that was – and has – to come. Furthermore, you must see that in the Dispensational world, it is firmly taught that the church will one day be permanently replaced with Israel! Reverse Replacement Theology! Which is Worse? That is right, according to Dispensational Premillennialists, God’s real purpose is, in reality, to replace what He had eternally purposed to establish, (the body of Christ, Ephesians 1:9f) and re-divide humanity! Dwight Pentecost says,“Gentiles will be the servants of Israel during that age” (Dwight Pentecost, Things to Come, (Grand Rapids, Zondervan, 1980)508). When the reign of Jehovah-Jesus is established, “The distinction of Israel from the Gentiles will again be resumed” (Pentecost, 519). He adds, “Objection is sometimes raised that God has forever broken down the barrier that separates Jew and Gentile and makes them one. This view arises from the failure to realize that this is God’s purpose for the present age, but has no reference to God’s program in the millennial age” (Pentecost, 528). Thomas Ice says, “At the parousia the times of the Gentiles cease and the focus of history once again turns to the Jews” (Prophecy Watch, (Eugene, Ore., Harvest House, 1998)264). Finally, Tim LaHaye and Thomas Ice, in their book Charting the End Times, state, “In the tribulation, there is no longer a body of believers knit into one living organism. There is rather a return to national distinctions and fulfillment of national promises in preparation for the millennium” (Tim LaHaye and Thomas Ice, Charting the End Times, (Eugene, Ore., Harvest House, 2001)117). So there you have it, Replacement Theology exemplified! The millennialists believe that the Old Covenant World of Israel, in which the Gentiles were outside the covenant promises (Ephesians 2:11f), the world in which the Jews looked on the Gentiles as dogs, is the ultimate, “determinative purpose of God.” What a glorious future the Gentiles have to look forward to, being slaves of the Jews! What is absolutely critical to see is that from the very beginning, it was God’s original plan to bless all nations in the Seed (Christ) of Abraham. His plan was not to confine His promises to one nation, but to all nations! To be sure, He dealt with Israel as His distinctive Covenant people for 1500 years. He created “one nation” from Abraham, but, to reiterate, it was His plan to bless “all nations” – not just that one nation! The purpose of that one nation was to bring that promised Seed into the world. But, when that Seed came, Israel and Torah were no longer – as they had never been! – His exclusive plan (see Galatians 3:19-28). So, God established Israel as His distinctive Covenant people. He blessed her and guided her, with the intent that when Messiah, the promised Seed of Abraham would come through Israel, the promised blessings on all nations would become a reality! This means that God kept His promises to Israel just as promised and just as planned! The problem was that Israel was not thrilled for YHVH’s blessings to go to all the nations! They thought they were so chosen, so elect, so distinctive that no one else was worthy! They failed to see God’s eternal plan, that the creation of the New Covenant demanded the passing of the Old World. That passing would be horrific and traumatic to be sure, but, it would give “birth” to the glorious, eternal Kingdom of Messiah. Fulfillment of God’s promises to Israel included the promise to establish the body of Christ. Thus, there was no failure. No postponement of the kingdom plan. No “Replacement Doctrine” in the negative sense ascribed by Dispensationalists to non-Dispensationalists. Don’t forget that Gary DeMar of American Vision will be debating Dr. Michael Brown on the issue of Replacement Theology, June 13. Follow this link for more details. In addition to that debate, I will also be debating Dr. Brown on Youtube, July 8. Our theme will be “the fullness of the Gentiles” and “the times of the Gentiles.” It will be a live debate, so be watching for the link! Both of these debates promise to be high level, cordial exchanges, of great benefit to the viewers / listeners. thanks Don for teaching truth. Thanks for visiting our site! Be sure to tell others! I really don’t mind being criticized for views that I actually hold. I hate being castigated for positions that I don’t hold. The replacement theology characterization label shows that dispensationalists simply don’t listen or read the positions of other people. How plainly can we state that there is only one olive tree. Gentiles have been grafted into it. Many Jews have been pruned out of it. They too can be grafted back in. What is so hard to understand? Peter was given the keys of the kingdom of heaven. Guess what He actually used them, he opened the doors to gentiles with the evangelization of Cornelius and his stand at the Jerusalem Synod in Acts 15. He also used them to close the doors on the Sanhedrian in the book of Acts. While it may have appeared that Peter was on trial…in God’s eyes the tables were turned and Peter and the 12 were sitting on thrones judging the 12 tribes of Israel. War was coming, the drums were beating, the vultures were gathering.